ST. PETERSBURG, June 3. /TASS/. 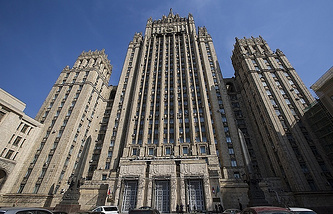 Conclusions regarding purported chemical attacks in Syria cannot be drawn solely on the basis of data obtained from social networks and bloggers, an OPCW team must conduct an on-site investigation, the Russian Foreign Ministry’s spokeswoman said. "The Organization for the Prohibition of Chemical Weapons (OPCW) has created a special mechanism to control chemical weapons in Syria and take them out of the country," Maria Zakharova said. "That’s what the Russian initiative was all about - to send specialists from this unit to conduct an investigation on site." She said that data gathered by experts as a result of such investigation will be more reliable than reports obtained remotely. "They have never been on the site," the Russian diplomat said. "They get information from bloggers, social networks, non-governmental organization and opposition parties. This may add something new to the general picture, but the most important thing remains missing - there was no work on site to collect and analyze evidence that may support or refute this or that theory." She said Moscow’s conclusions regarding the situation are based on data obtained by Russian experts and servicemen deployed in Syria. "But they do not believe us. We urged to deploy experts from a special group there. But they refuse. The question is why," Zakharova added. The incident with the alleged use of chemical weapons in Khan Shaykhun in Idlib province took place on April 4. According to Russia’s Defense Ministry, Syrian aircraft struck terrorists’ workshops producing chemical agents. Washington accused Damascus of using chemical weapons, after which the US Navy delivered a missile strike overnight to April 7 on a Syrian military airfield in the province of Homs. Russia has repeatedly called for sending an OPCW team for an on-site investigation into the matter.